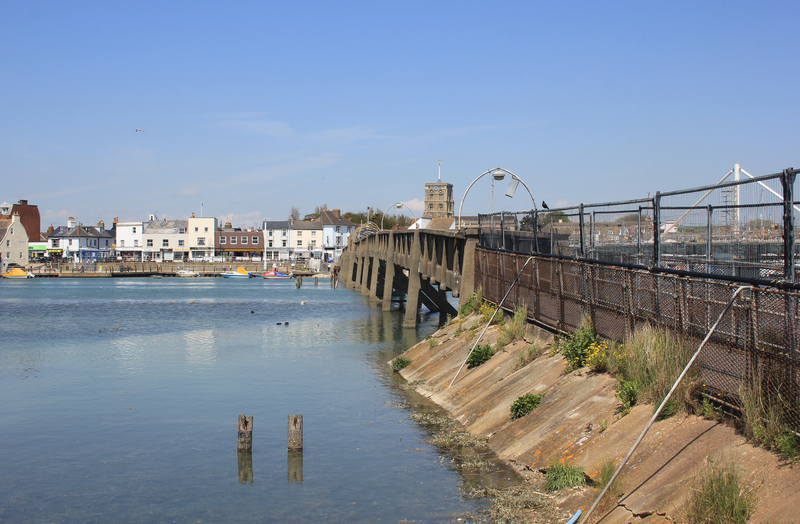 The town centre of Shoreham lies on the north bank of the River Adur. On the south bank, and just a little to the west, lie a number of houseboats. We could see them as we crossed the Norfolk Bridge to get back to the coast. Once across the bridge, we took a narrow footpath which runs between the houseboats and the back of some houses which lay behind. Every now and again, as we walk around the coast of Britain, we come across some completely unexpected treasures. This was one of those occasions. 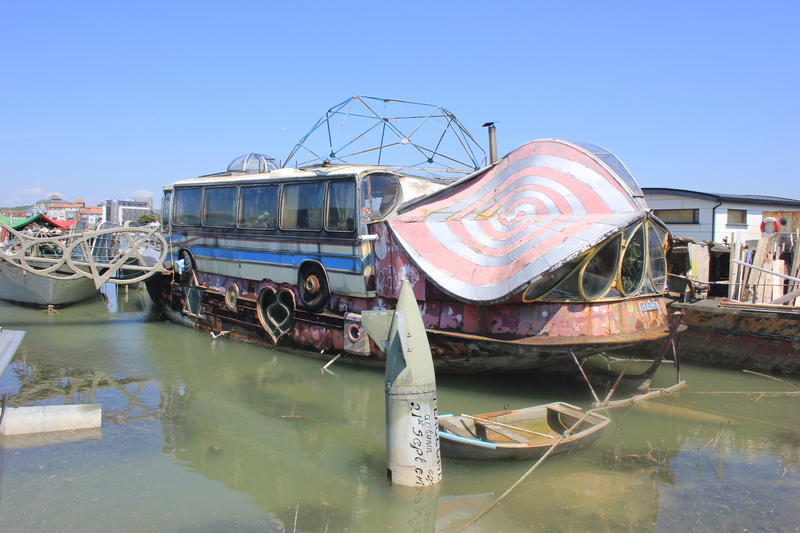 The first houseboat we saw on the path gave a flavour of what was to come. I love the rickety sheds stood next to it. 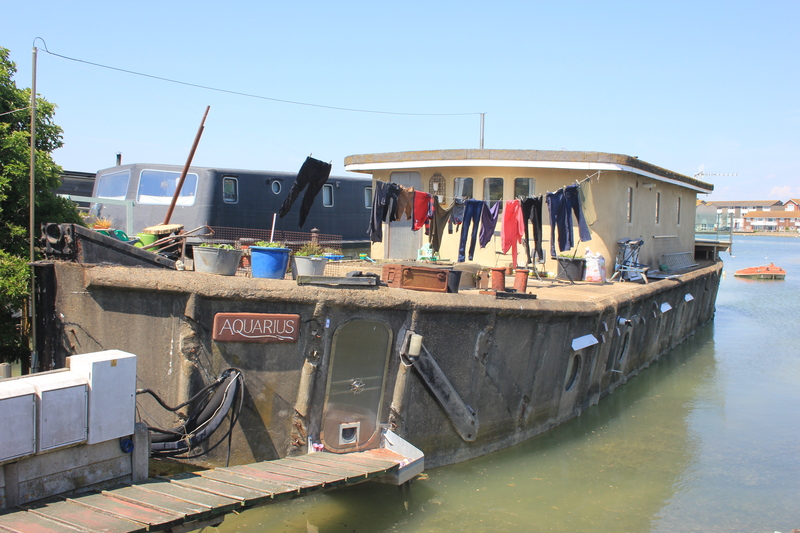 The houseboats here comprise a vast array of variety and ingenuity. Very few of them seem to be seaworthy. Later in the day, the taxi driver taking us back to our car told us that most would sink were it not for the fact that they sit on concrete bases. Whether or not this is true I do not know, but if it is the bases are not the only thing made of concrete here. 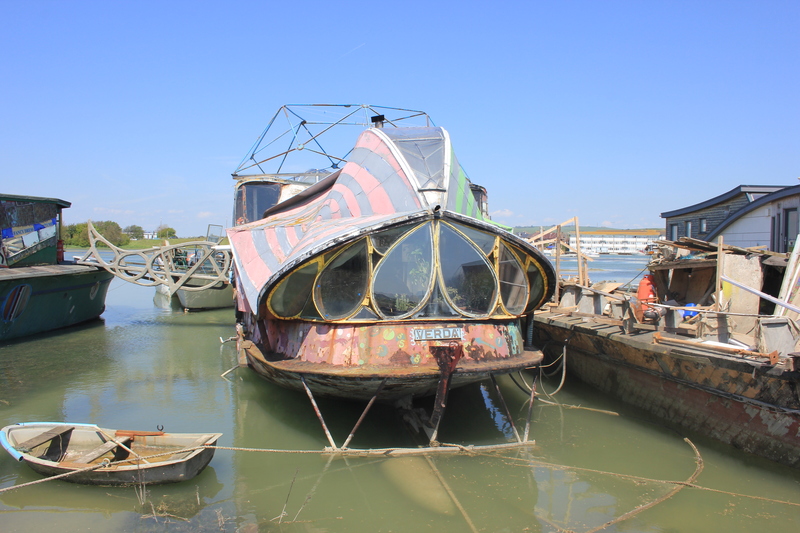 Have a look at the Aquarius, which is itself made out of concrete! 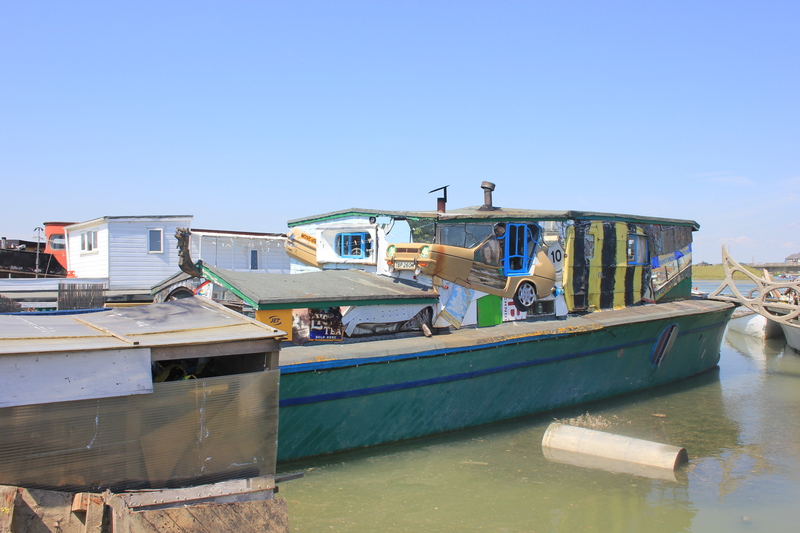 Some of the houseboats were well kept and inviting. Others needed a little bit of attention. 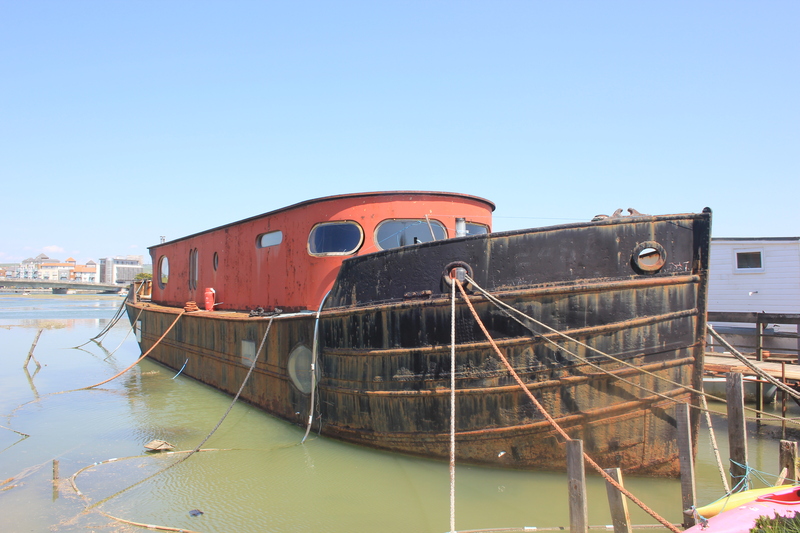 The houseboats included this monster; the biggest of them all. 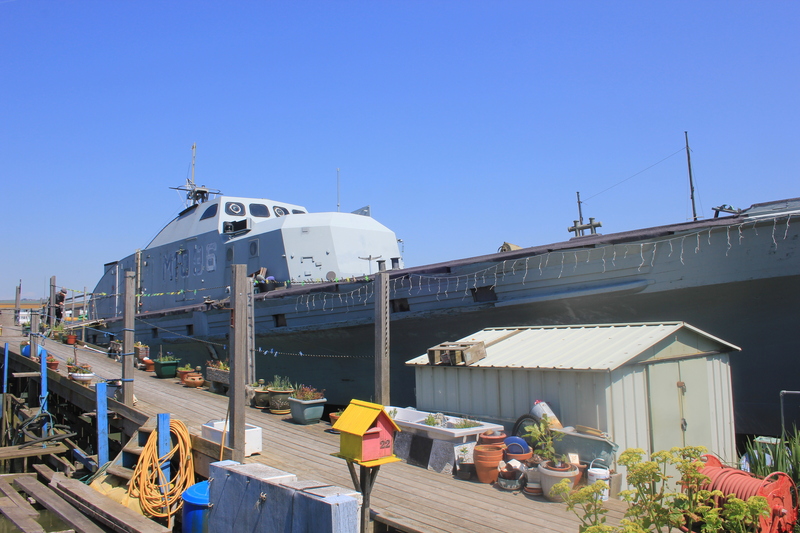 It is an M1096 Fische Schütze Class Minesweeper, now put to more peaceful purposes. 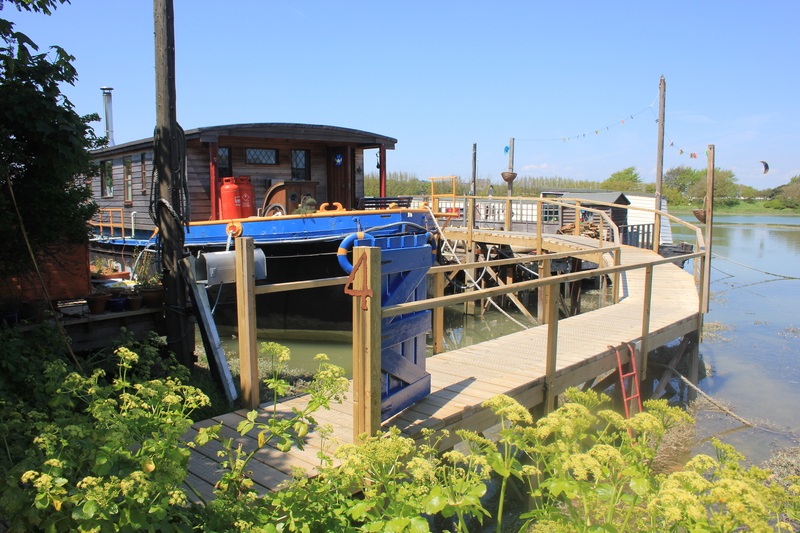 I liked this next one, which had been moored sideways on and which had a beautifully curved jetty leading to its door. 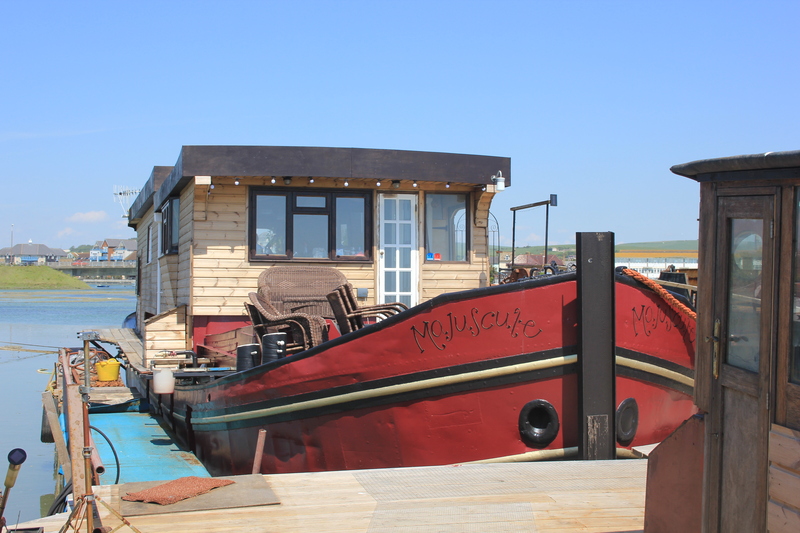 But best of all was the magnificent Verda, quite simply the best-looking houseboat I have ever seen, and the best-looking houseboat I think I shall ever see. How’s this for a picture window? I’m sure Captain Nemo would feel right at home here! But that’s not all! The Verda takes recycling to a new level – look! It’s made out of a coach, wheels and all! It’s next door neighbour shared certain design features – the two were linked by a footbridge, so I assume they are in the same ownership. 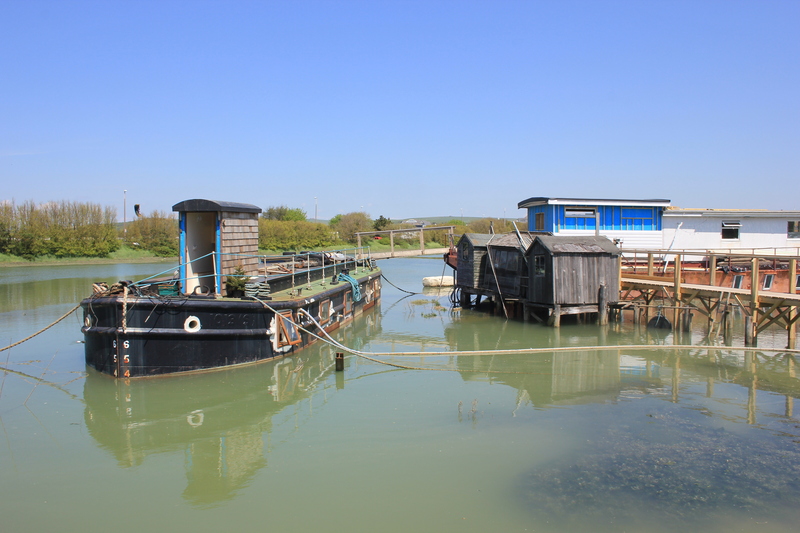 Just after we left this line of watery dwellings, we passed the southern entrance to the Shoreham footbridge. It was only because this footbridge was closed that we had to walk on to the next river crossing and so, by chance, got to see the houseboats which were the highlight of this walk. 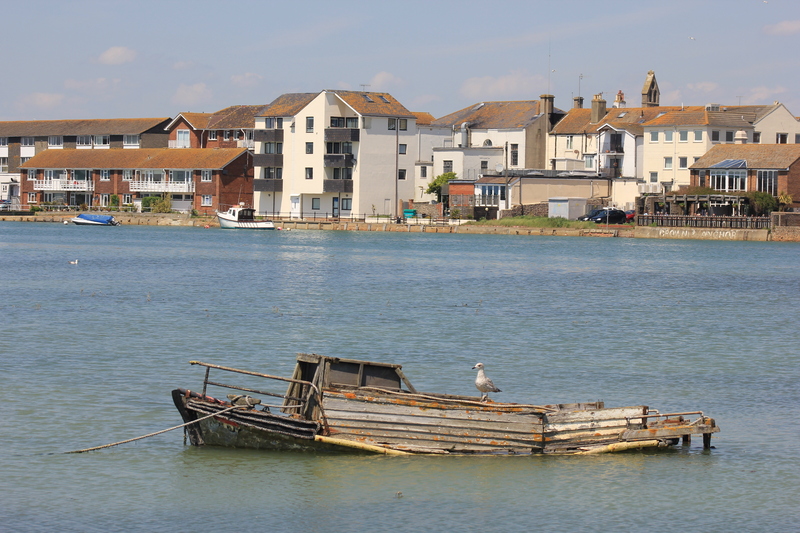 This entry was posted in West Sussex and tagged coast, houseboats, shoreham, travel, walking, west sussex. Bookmark the permalink. We were desperate to cross at the footbridge, having just walked a mile or so along the road through an industrial area. It was very frustrating to find it closed, but ultimately it meant we saw something that became the highlight of the day. The colorful laundry hanging on the concrete boat gives it such a homey touch! & I love how they are using the container-garden system! How I’d love to take a peek inside some of these boats!